More than one-third of the population of the United States now lives in the South, a region where politics, race relations, and the economy have changed dramatically since World War II. Yet historians and journalists continue to disagree over whether the modern South is dominating, deviating from, or converging with the rest of the nation. Has the time come to declare the end of southern history? And how do the stories of American history change if the South is no longer seen as a region apart--as the conservative counterpoint to a liberal national ideal? The Myth of Southern Exceptionalism challenges the idea of southern distinctiveness in order to offer a new way of thinking about modern American history. For too long, the belief in an exceptional South has encouraged distortions and generalizations about the nation's otherwise liberal traditions, especially by compartmentalizing themes of racism, segregation, and political conservatism in one section of the country. This volume dismantles popular binaries--of de facto versus de jure segregation, red state conservatism versus blue state liberalism, the "South" versus the "North"--to rewrite the history of region and nation alike. Matthew Lassiter and Joseph Crespino present thirteen essays--framed by their provocative introduction--that reinterpret major topics such as the civil rights movement in the South and the North, the relationship between conservative backlash and liberal reform throughout the country, the rise of the Religious Right as a national phenomenon, the emergence of the metropolitan Sunbelt, and increasing suburban diversity in a multiracial New South. 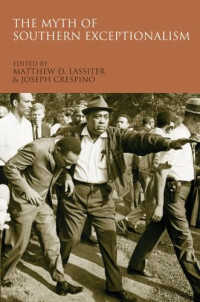 By writing American history across regional borders, this volume spends as much time outside as inside the traditional boundaries of the South, moving from Mississippi to New York City, from Southern California to South Carolina, from Mexico to Atlanta, from Hollywood to the Newport Folk Festival, and from the Pentagon to the Attica prison rebellion.